Hello there NY Melrose Family readers! It’s Serene from House of Yumm again! I love coming to visit all of you to share delicious treats! How is everyone enjoying Spring so far? We’ve already enjoyed some rain and some sun. Spring is my favorite time of year. It makes me think of having brunch! Which makes me think of eclairs. Oh how I love eclairs! So today I am sharing with you an easy way to enjoy the flavors of eclairs without so much work! 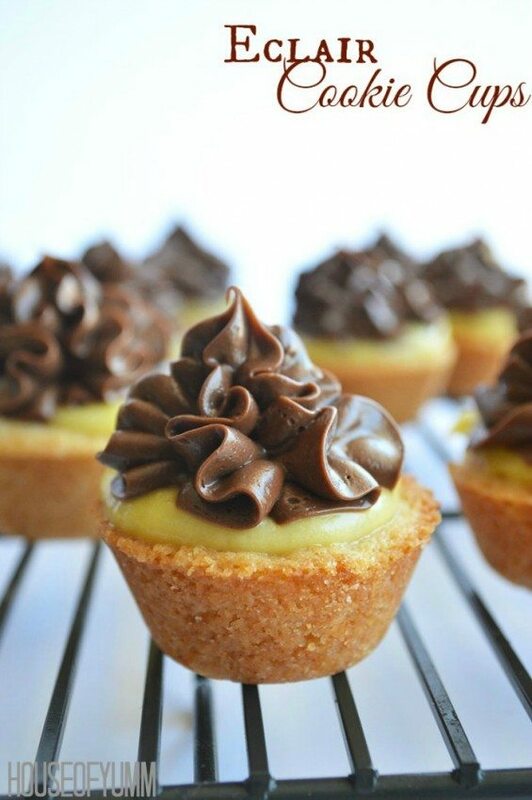 These Eclair Cookie Cups are filled with a delicious vanilla cream and topped with a chocolate ganache frosting that will have your tastebuds singing. While I love the softness of the pastry filled eclairs, sometimes, or most of the time, I don’t have the time to properly duplicate it. While playing with doughs is fun, it can be challenging and time consuming. 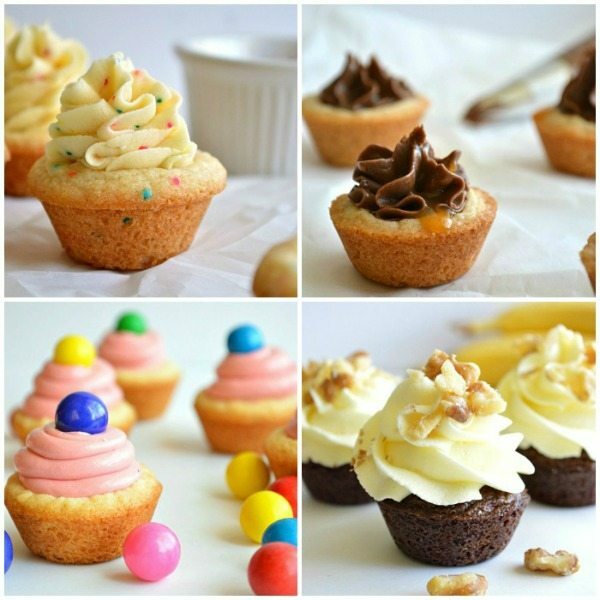 So when the urge to indulge strikes, have no fear, the cookie cup is here!! I am a huge fan of making cookie cups, if you don’t believe me, just scroll to the bottom to see a fun collage I put together for you sharing some of my favorites. 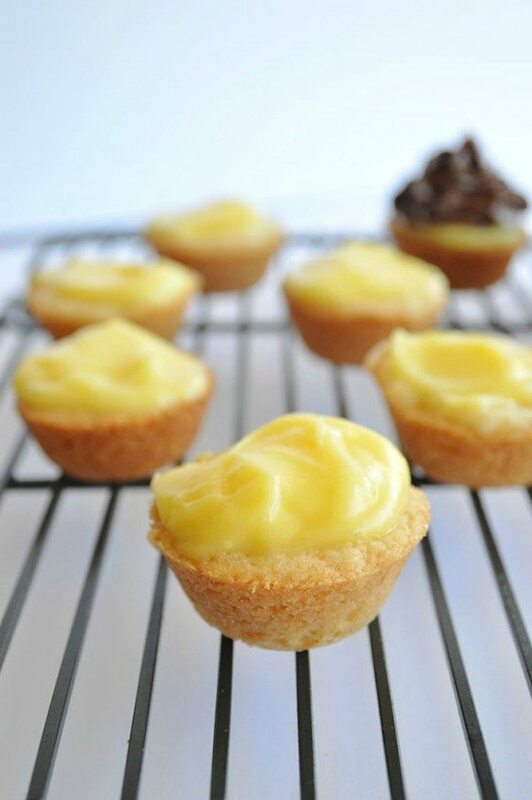 These start as regular sugar cookie cups, then I filled them vanilla pudding. While again, it is simple to make a tasty vanilla pastry filling, it usually needs to set overnight. And I don’t know about you, but when a craving hits, I usually don’t like to wait for things overnight. On top of the vanilla pudding I swirled on some decadent chocolate ganache frosting. Pure chocolate bliss is what this is. And I mean that literally, this frosting is basically pure chocolate. Rich and decadent. Plus super easy to make, the hardest part of this recipe is waiting for the chocolate to cool allowing you to pipe it on! As the chocolate ganache sits and cools it becomes thicker. A quick trip to a mixing bowl on high speed and it’s thick like frosting and you can pipe it on so it looks really pretty! I hope you all love the simplicity of this recipe! Make sure you come check out my site at Houseofyumm.com, for more time friendly and family friendly recipes. While I do love sweets I also share some healthy snacks, family dinners, and everything else in between. You Can Follow Along With Me So You Never Miss A Recipe!! Preheat oven to 375 degrees. Grease mini muffin tray and set aside. Prepare the sugar cookie mix according to directions. Roll the dough into small balls approximately 1 inch in diameter. Place one ball of dough into each space of the mini muffin tray. Press down the dough with a round spoon to create a small crater in the middle. Bake for approximately 9 minutes, cookie cups will be slightly golden around the edges, they will still be slightly soft. Once you remove them from the oven press in the center with the round spoon again to re-create the crater in the center of the cookie cup. Allow to cool in the pan for another 5-8 minutes, then remove to continue cooling on a wire rack. 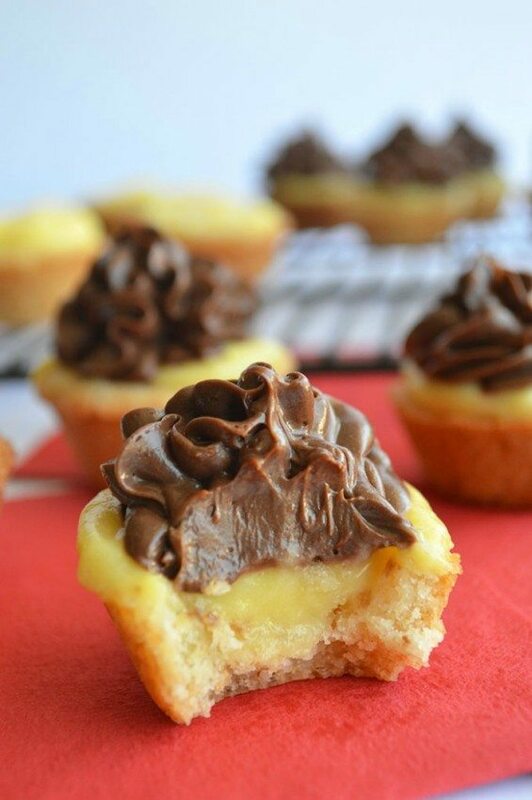 To make the pudding combine the 2 cups of milk with the package of instant vanilla pudding. Stir for several minutes to ensure it is fully mixed and place into the refrigerator to set. To make the chocolate ganache frosting pour the chocolate chips into a medium size mixing bowl and set aside, pour the heavy cream into a small saucepan and bring to a low simmer. Allow to simmer for 2-3 minutes and then pour the hot heavy cream over the chocolate chips. Stir until the chocolate chips are fully melted and heavy cream and chocolate are completely combined. Allow to set and cool to room temperature for approximately an hour. As it cools it will continue to thicken. If the consistency has not thickened, put them in the refrigerator for an hour, but continue to check on it. Once the ganache is cool, pour into large mixing bowl and using mixer beat over high speed for 4-5 minutes. This will thicken it even more to be able to use the ganache as a frosting. Scoop the ganache frosting into a piping bag, I used a Wilton 2D tip. To assemble, take a spoonful of the vanilla pudding and scoop it into the crater of the cookie cup. It's ok to add extra pudding so it sits higher on top of the cookie cup. Then pipe on the chocolate ganache frosting. Serve immediately and enjoy!! Can be stored in a sealed container in the refrigerator for 1-2 days. So cute! Love all of your little cookie cups! I made these today & everything was fine except the ganache. The instructions say to whip it 4-5 min til frosting consistency, but mine never thickened. And I whipped it 9 full minutes! What did I do wrong? I made these last year and was disappointed to have so much extra pudding and ganache. The kids ate the pudding but the ganache ultimately went to waste because it was a super busy week and I didn’t have time to figure out a use for it. I made a note, though, because the cookie cups were really good. Just made them again and doubled the cookie recipe. There was plenty of pudding and ganache (with even still a little bit leftover) for 48 cookie cups. I do think you should adjust that part of the recipe and the yield, or else link to some recipes for uses for the leftover pudding and ganache. I made them for my son’s swim team banquet tomorrow night and I know everyone will love them. To the person having trouble with the ganache – another recipe tweak – if you chill it in the fridge for an hour it will whip and thicken nicely. What is sugar cookie mix? 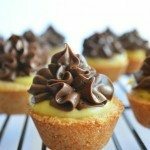 Trackback from Black Forest Cookie Cups - Chocolate Chocolate and More!